hair | Oh, The Glamourous Life! Happy Friday! I’m back from the New Orleans Burlesque Retreat and thoroughly inspired. I’m still thinking about all I learned, but you can probably expect to see some tidbits here eventually. But now, here’s your tip! Sleeping in your hairstyle? 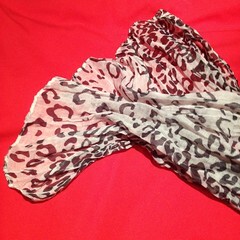 Wrap it in a silk scarf. Whether you’re setting your hair overnight or trying to get another day out of your elaborate do, use a silk scarf to swath your hair before bed. The slippery fabric won’t snag your tresses as you move in your sleep and will help protect your style all night. I don’t have great hair. I love the color and the way it curls, but it’s very fine and rather thin and doesn’t grow very long before it starts looking straggly. I rarely seem to have time to go to the salon to keep it nicely trimmed and besides, my favorite stylist, Diamond DeVille, works in a different state. This is why I generally have my hair pulled back in a simple twist. When Scratch suggested I try wigs, I was resistant. It was like admitting I had terrible hair. I had worn a wig before, at BettySioux Taylor’s first Salute to Bettie Page. Everyone wore Bettie wigs, so I was okay with that. Several people commented how different (and good I looked), but I was still sure wigs were not for me. My first real wig wearing was because I was doing a tribute to a Legend who had a black pageboy in her heyday and my red head just would not do. Fortunately for this wig novice, I had the expertise of Sydney Lauren Robinson to help out. She took me wig shopping, styled the wig, put it on me the first time, and made me helpful videos demonstrating how to wear it. Having seen me do the same act with the wig and without, Betty Blaize commented that I moved differently when I was wearing the wig. It did help get me into character to be wearing the wig and I became a little more of a convert. But not completely. I ended up getting a couple of wigs to wear as The Diva in The Wrathskellar, which was okay, because she wasn’t me. Like in the above tribute, I was playing a character. Somehow I realized I wasn’t sacrificing my personal integrity or anything if I wore a wig on stage. In fact, I began to embrace wigs. I could change my look for each act. I didn’t have to spend the time curling and pinning my hair. I didn’t have to worry if I was having a bad hair day. All good reasons for going with a wig. A couple things I’ve learned about wearing wigs. These days I am completely sold on wigs, although I still can be found with my real hair on many an occasion. How about you, Dear Reader? Are you a fan of wigs? For hair that is dry, dusty, and in need of a refresher: wrap a natural bristle brush with cheesecloth (so the bristles poke through) and spritz with rose water. Brush your hair. Change the cheesecloth as it gets dirty. Of course, you can use any flower water with a scent you like, or even plain water in a pinch (preferably bottled or filtered). *Burning Man is so not my thing, but if it’s yours, I hope you’ve been having fun! Happy Friday! Time for a tip! If your hair looks greasy, comb a little baby powder or cornstarch through it. Make sure you get all the powder out! You can buy dry shampoos, but this works just as well, especially in a pinch. I’ve run out of burlesque books to review, so I’m trying non-burlesque, but related books for a bit. Vintage Hairstyling: Retro Styles with Step-by-Step Techniques, 2nd Edition by Lauren Rennells (2009). I bought the first edition of Vintage Hairstyling when it first came out and was quite happy with it. When the author asked for feedback for a second edition, I jumped at the chance, especially since she was offering a copy of the new version as thanks. The first edition was the best book on retro styles around, head and shoulders above the once-much-sought-after Daniela Turudich book. Lauren Rennells shows how to create hairstyles using modern equipment like curling irons and velcro rollers. Even a hair dunce like myself was able to produce some great looks. 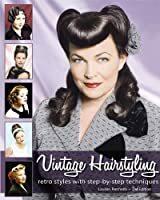 With clear and beautiful photographs she demonstrates the styling basics, like finger waves, victory rolls, and pin curls before turning you loose on a vast array on styles, growing ever more challenging as you move deeper into the book. As an added bonus there is a section on finishing touches, like hair ornaments, makeup, and nails. The second edition has even more details on the basics. I notice she added steam rollers and soft rollers to the arsenal of equipment. She has extended her time period and included some ’50’s and even ’60’s hairdos (with the popularity of Mad Men how could one not). I was particularly pleased to see that the hairdo staple, the French Twist, was taught as a stand-alone ‘do before being used as the basis of other styles, like “Beehive” and “Golightly”. Some of the styles from the first edition have been rewritten. “Film Noir”, a style I liked, but hadn’t tried because it involved numerous wet-set pincurls, has been redone using velcro and soft rollers. She did edit out a couple of hairstyles, like “Casino Owner’s Wife”, from the first edition, so that volume will be staying on my bookshelf. She has introduced some new techniques, like working with fake hair and making marcel waves, and has expanded the “extra” information. I do have one gripe with this book. It’s has a very attractive design and a lot of lovely photographs, illustrating each technique or style step-by-step, as promised. But it’s a poor workbook. It doesn’t lie flat while one is styling one’s hair. The perfect binding makes it look like a “real” book, but sometimes I wish it was spiral bound, so I could have it open on my vanity while my hands are busy with curling paraphernalia and pins. When adding extra curl to curly hair, you can often get a quick, no-heat curl this way. -Determine the shape of the natural curl. -Wrap it around your finger accentuating the direction. -Pin the curl to the side of the head for 5 minutes (until the spray dries). -Unpin and comb gently. Perfect for trailing wisps and that one strand that won’t play well with others. It’s Friday! Time for a tip! Clean hair is hard to style. If you don’t wash your hair for at least a day before your big ‘do, it behaves much better. A hair flower is not only a glamourous accessory; it can be used to hide imperfections in your hairdo.